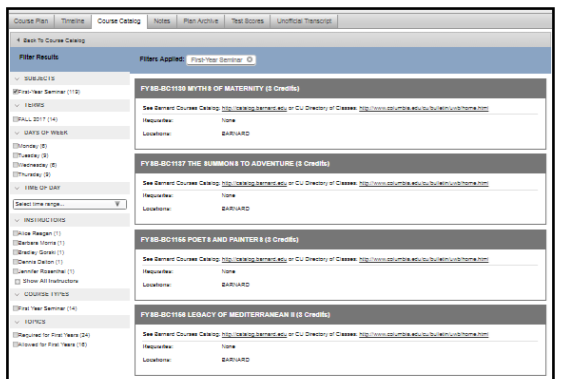 Only students can add and drop courses, but Advisers can look for courses and available sections in the Course Catalogue within myBarnard/Student Planning, and use the filters available. You may wish to look information up while meeting with Advisees to help them see what courses are available in a given semester, and which courses may count for particular requirements. 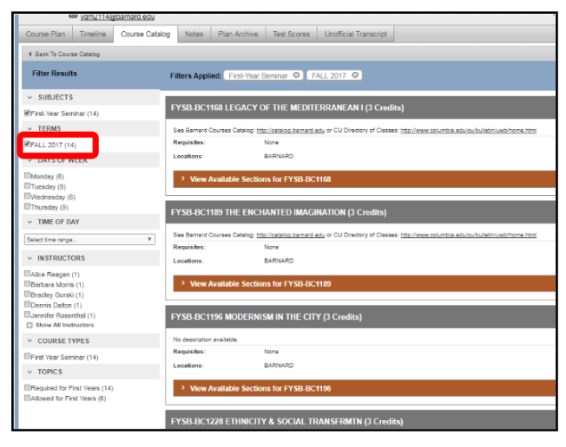 If you know the course name or course code of a class you are looking for, you can search for it directly from the “Search for Courses” search box on the top right of the blue bar at the top of every screen of a student’s record. For example, if you want to find the History course “American Civilization to the Civil War,” you can type the name or the course code, HIST-BC1401, into the search bar, and hit Enter on your keyboard. From there, it will show you all the courses matching the name or the course code. Pro Tip 2: Student Planning requires a hyphen between the department code and the course number in order to recognize a which course you mean. Another way to search for courses is via the Course Catalogue. You can access the Course Catalogue in Student Planning from within any student’s record, by clicking on the Course Catalogue tab. From there, you’ll be taken to a list of departments and subjects. Click on a department or subject title to see all the courses offered by that department or subject. You can scroll down or use keywords to narrow your subject/department search. In the example below, First-Year Seminar is used. This will take you to a list of all courses currently and recently offered in the selected department or subject as seen in the screenshot below. 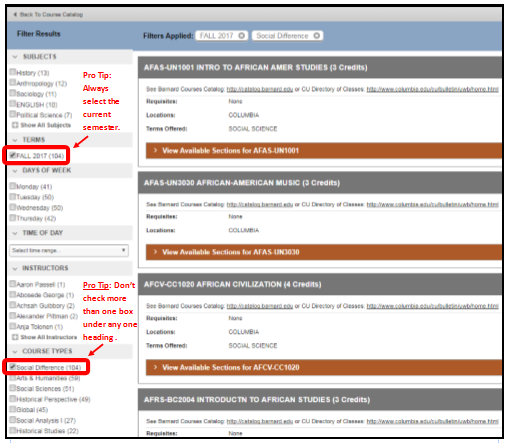 Note that only those courses with a bronze “View Available Sections” bar are being offered in the semester for which a student is registering. Avoid confusion by filtering for the desired semester. 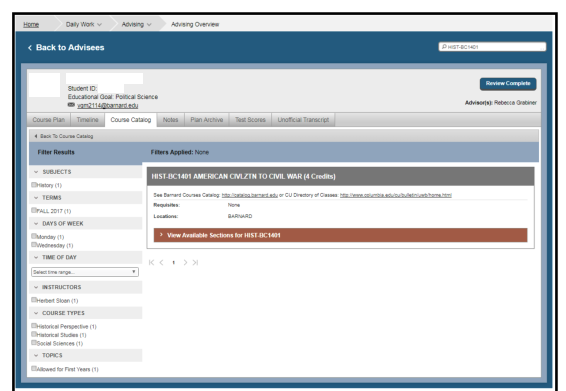 Advisers can click on "View Available Sections." This is as far as you can get as a student’s Adviser. 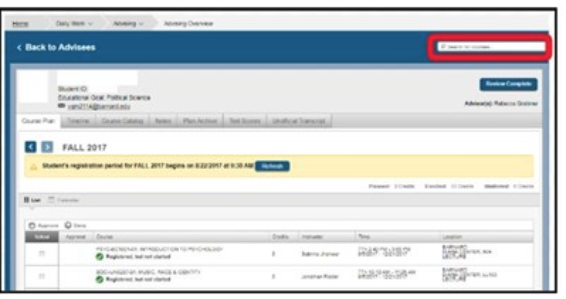 Students who get to this point in the course catalog will also see a blue button that allows them to add a selected section to their plan. During their online registration appointments, assuming they have secured your permission to register, they will see a blue button that allows them to register for individual planned courses or all planned courses. If you are advising students who fall within the "Nine Ways of Knowing" curriculum, you can find which courses satisfy their requirements here: Nine Ways of Knowing courses.